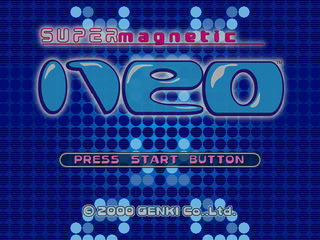 Super Magnetic Neo (スーパーマグネチックニュウニュウ) is a Sega Dreamcast platform game developed by Genki. It is similar to Crash Bandicoot in design, as it switches between 2D and 3D views. The player controls a robot named Super Magnetic Neo who must save Pao Pao Park from baby Pinki. Neo has a large and powerful electromagnet attached to his head, and changing the polarity of this magnet can alter the environment. Main article: Super Magnetic Neo/Magazine articles.